One of the attributes of my bike (the first non-traditional ballooner) was the strength of its fat tubed frame, as well as its fatigue resistance. At the house of Cannondale, aluminum tube bikes had gently curvilinear tubing–unintentionally– and an annoying tendency to fatigue near the weld zone. “There goes the neighborhood” we thought, and aluminum’s reputation was tarnished. Then Gary Klein decided to make mountain bikes as well as his celebrated road bikes, and threatened suit us against us and Cannondale for breach of his “patent” on the stiffness of aluminum tubing…. It took some doing, but Charlie’s lawyer was able to show that a lifetime total of 175 custom bikes were no threat to Klein’s livelihood. GK’s classmates at MIT pointed out their alu-bike was a team project and no single person was the ‘owner’ of the technology. I don’ t know the outcome of the suit against Cannondale, since both parties always claim to have won. Vacationing in Moab in 1986, I swapped bikes with a fellow who said he loved his lightweight Klein but that it ‘beat him to death’ on the rocky desert terrain. In a minute of riding his, I felt what he meant, but couldn’t account for it since I’m mechanically retarded. Later Charie explained why it might have felt more jarring: the tubes were nearly twice the diameter and presumably a bit thicker on a Klein…as a way of combatting the dreaded fatigue issue. My ‘Ham didn’t behave that way. “Darren” went off feeling more “inKleined” to be charitable towards aluminum-the-material. Proprietary recipes & processes plus a secretive heat treating ritual conducted over our fish pond would alchemize a freshly-welded frame from ‘butter soft’ (Charlie’s term is solution heat-treated) to “artifically aged”. Charlie’s buyers didn’t have to return their broken frame each season, the way Gary Klein’s pro racers (and clydesdale riders) did. Klein had a Free Repair/Replace policy, but it was hecka inconvenient to be without one’s steed for six weeks or so, whenever the frame developed a crack. 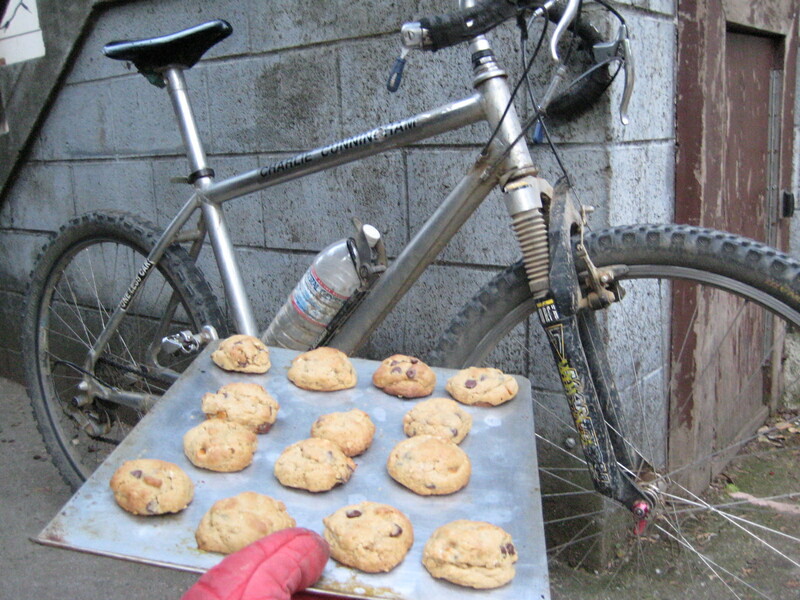 Which shouldn’t bring me to baking but since it was a special baking process that helped Charlie’s bikes feel ‘supple’ (yes, those silly adjectives sometimes actually describe the riding experience), I am compelled to write about ….cookies. The national cookie (try getting one in Europe–no way. But of course they have about a hundred far better cookies to compensate). My friend Robin Hashem has a (proprietary) recipe that if I would just follow to the letter I could make a decent cookie. It is not just the ingredients; it’s the process. For example, she says “preheat oven to 325 degrees, then turn down to 300-315 degrees ….mix (secret) ingredients and bake slowly for ten to fifteen minutes”. So intent was I on the correct adjustment of our irritable gas oven, I let my guard down in the ingredients department. Namely I succumbed to the subgenius impulse to toss in that tiny baggie of antiquated granola from 1973, to ‘use it up’. Thereby imparting an unhappily stale note to a tray of cookies that shoulda, coulda, woulda been Hashem-perfect. 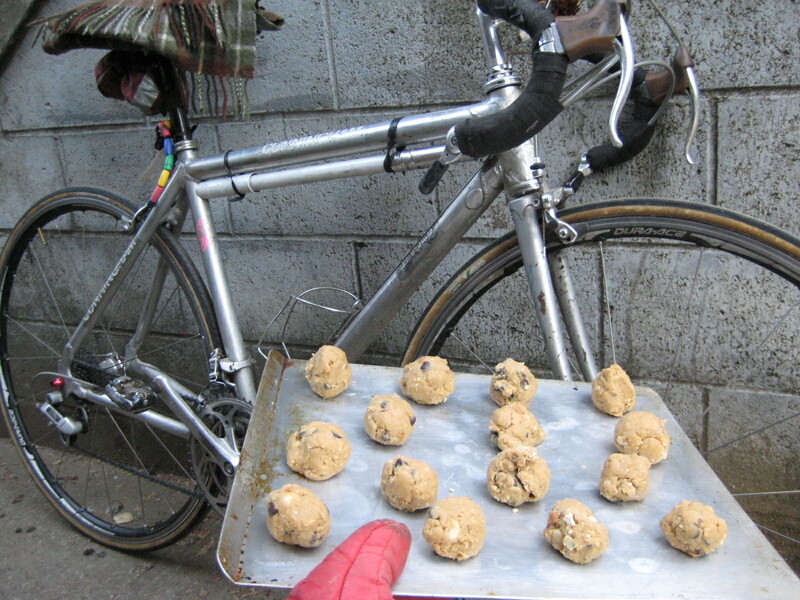 Still, the heat treatment visibly improved the cookies, as it does with the bikes (see enclosed pre-and post-treatment photos)… and despite that misguided impulse at the expense of freshness (anything scored in the last year is considered ‘fresh’ in my book)….the cookies were pretty good. They will not last, though. And I pray there is no cookie-return feature with my modified, inferior product. ~ by jacquiephelan on March 26, 2008. Jacquie – don’t know much about busting Kleins as I was never working somewhere that got me EP pricing on one, but did do a number on the first round or two of M2s from the big S. This of course really has nothing to do with your post since they were way later on the timeline of big tubed aluminum, but since you visited me and I couldn’t get the reply thing to work right from my blog I thought I’d drop in here…email me direct and lets chat about bringing a tea party to central PA…I’d love to!